Up to now, our focus has been on preparing for production. With Joseph Williams as Celliers’ R&D right-hand, and Joseph Malebo, Abe Manoto and Jeremia Mtakati at the core of this team, we have built a solid foundation to kick-start production. Stoney Magashule works most closely with Joseph Malebo on moulding and ensuring that finishing and assembly is to our high standards. Jeremia Mtakati, Thabiso Mohono and Abe Manoto, together with Shadrack Magashule, David Thekiso, Pape Radebe, Peter Mokotedi and Gibson Nthoseane have had their work cut out these past months with the labour-intensive task of making patterns and polishing moulds. Meisie Malebo and Abraham (not pictured) keep our factory floor and facilities shipshape. 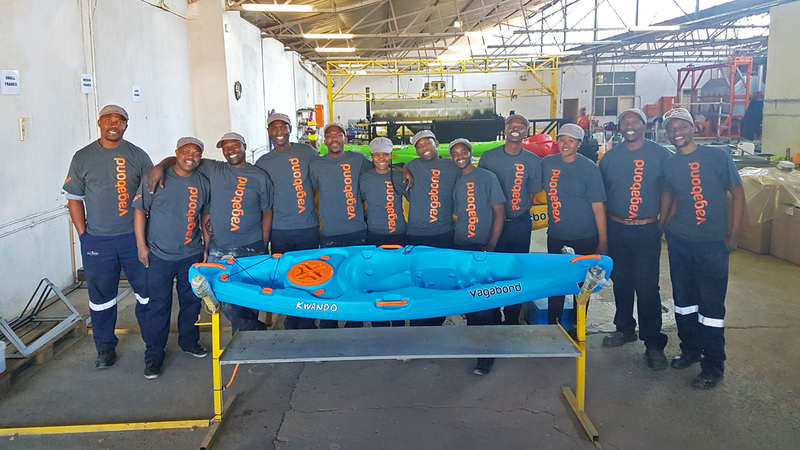 Together, our team have achieved the incredible task of turning Celliers’ designs into 11 physical kayak moulds in six months. As we go into production, this fine team will be more involved with moulding, finishing and assembly rather than the intensive R&D that has been our focus. (L-R) Joseph Malebo, Pape Radebe, Jeremia Mtakati, Peter Mokotedi, Thabiso Mohono, Stoney Magashule, Gibson Nthoesane, Shadrack Magashule, David Thekiso, Meisie Malebo, Abe Manoto, Joseph Williams.